When rebuilt in the 1950s the Conway Yard, 20 miles northwest of Pittsburgh, replaced Harrisburg's Enola yards as the Pennsy's largest freight-classification facility. Used for sorting loaded freight cars into trains, the automated Conway Yard could classify 9,000 cars a day. This 1958 painting by Grif Teller shows only 54 of the facility's 197 tracks. 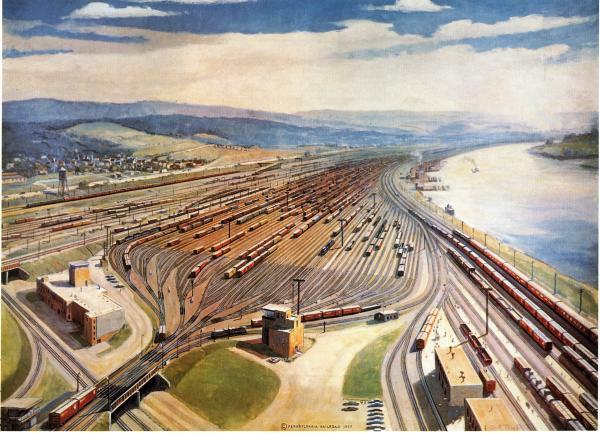 The painting does not include the nearby Jones and Laughlin Steel mill, which Teller eliminated so as not to offend the PRR steel shippers who were J & L competitors.